Different studies seem to come out every day that contradict each other: Either we’re bouncing back from the recession or we still have a long way to go. 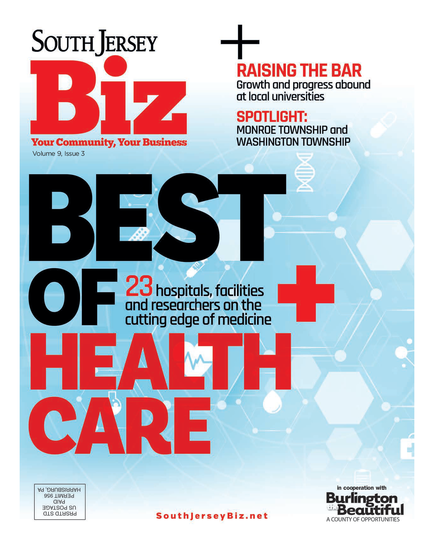 But if you look at this year’s list South Jersey’s Fastest-Growing Companies (which all recorded revenue of at least $500,000), it’s clear that they’re doing more than defying the odds; they’re showing what’s possible here in South Jersey and what a great place this remains to do business. This year, we also asked all of the companies to share their thoughts on the biggest risk they ever took, or the best advice they could give to readers, providing a little insight into how they got where they are today. How exactly do you reach an increase of 7,976 percent? You raise revenues from $231,000 in 2009 to nearly $18.7 million in just three years. For Dynamic Defense Materials, it was thanks to their patented, portable armored guard posts called McCurdy’s Armor. This defense system is used to replace the sandbags used in warfare that can’t protect against mortars, rockets and other artillery. Having already sold to the U.S. military, DDM is now optimistic about moving into foreign markets. The fact that WebiMax was founded around the cusp of SEO emergence is evidenced in its revenue: up from $241,188 to $7.1 million last year. The company specializes in search engine and social media optimization and marketing, paid search and pay per click management, reputation management, website design and development, and more. Just as impressive as their own growth percentage, thanks to an increase in revenue from $429,153 to $3.9 million in 2011, is the average amount of savings passed on to the customers of Free For All’s RxCut Plus program, a free prescription savings card which provides cardholders with savings of up to 75 percent on medications and up to 50 percent on laboratory and imaging services. Since 2008, the program has saved cardholders more than $75 million. Pro Computer Service has built a recognized brand of IT managed services, on-site and remote computer support, project management and IT staffing rather quickly. The company began as a startup in 2001. Today, it has grown to 30 employees and has expanded into four states, with goals to expand across the Delaware Valley and along the East Coast. NEST international has grown so rapidly in recent years that their immediate goal is simply to find a larger New Jersey office to fit all of its 117 local employees. The company, which reported $41.8 million last year, provides national facilities maintenance services, offering businesses the opportunity to run a leaner operation and reduce their expenses. Services range from routine maintenance, break/fix service calls, and project/capital expenditure management. “The best risk we ever took was investing 60 percent of our startup capital funds into technology and communication systems. This has allowed us to gain great efficiencies and to compete with larger organizations.” --Bob Almond Sr.
Ancero’s name may be just four years young—it resulted from the merger of Media Systems and Eastern IT Group—but its executives’ 25-plus years of experience each has resulted in continued success, as Ancero is one of the leading providers in the tri-state area of IT consulting and managed services, managed hosting, cloud solutions, and hosted VoIP. The company is on track to hit $10 million this year. Conigent is a process improvement and business management consulting firm focused on designing, implementing, and optimizing cloud applications to alleviate operational bottlenecks. Services include software selection, value assessments, ERP, CRM and Edge Process solutions. This year, as part of its development of an athletic services division, Conigent created the product Wodify, a cloud-based application that improves athletic performance in the CrossFit industry and helps affiliates manage their box. Distribution One, with offices in Mount Laurel, Texas and Sweden, provides ERP software and support for wholesalers and distributors. With their software technologies, Distribution One ensures the lines of communication remain open and businesses can run both efficiently and profitably. Scientific Search specializes in technology recruiting and staffing services, particularly in pharmaceutical, engineering, information technology and market research. Among the top goals for the business, which reached $4.5 million in revenue last year, are to continue to receive referrals and repeat business and expand its own staff to keep up with the growing company. Tim Chew left what he calls a cushy job in Florida to open a business in the poorest county in New Jersey with less than $25,000 in startup funds. It’s a risk he’s glad he made: Today, BC Processing deals in electronic payment services, POS software/hardware for retail and restaurants, managed IT/network solutions, and custom software development centering on payments and inventory controls. The company processes $1 billion annually and has plans to reach 1,200 active customers by the end of 2013 and create five new jobs. When eMaint began, its CEO saw a profitability mountain to climb when it came to subscription-based software, a new delivery model in the 80s. Reaching $4 million in revenue last year, eMaint is going strong, providing Web-based Maintenance Management Software and related services to more than 16,000 users worldwide across 1,000 organizations, ranging from small companies to Fortune 500 clients. Liberty Healthcare Services covers the majority of the state with its home health care staffing, and President Kevin Zepp plans to make it a leading regional provider that brings quality, stay-at-home care to the residents of South Jersey. Zepp also has plans to continue to “mature” its service lines in areas such as pediatric homecare and staffing services. Concord Engineering has found success by providing diversified services such as facility and power plant design, energy efficiency and infrastructure master planning, design financing and construction management. The company works with clients in the commercial, industrial and power sectors. SeriousShops.com, an e-commerce wholesaler and retailer, has seen steady growth since its founding 10 years ago. In fact, it opened its first Midwestern distribution center earlier this year in Missouri. Offering more than 10,000 items ranging from toys and games to specialty beverage ingredients, SeriousShops.com achieved $5.6 million in revenue in 2011. Radwell International, which reached $65.8 million revenue last year, recently expanded into Canada and the United Kingdom and sees more growth coming in the future. The goal is to hit $100 million in sales by 2014. Radwell stocks and sells new, surplus, industrial automation, MRO, pneumatic, motion, electronic, hydraulic, HVAC and electrical control equipment for plant floor and facilities maintenance machinery. Husband and wife team Sherri and Gary Johnson see a skills gap in our nation’s workforce, and so one of the major initiatives of their staffing company—which concentrates on manufacturing, administrative and IT industries—is to expand their capabilities to help address the need to bring manufacturing jobs back to the United States. Travel Tribe brings travel agents and clients together like never before. The company is comprised of multiple websites, including TravelTribe.com, a social networking site where travelers come together to get expert advice, share experiences and join Tribes to discuss their favorite destinations and more. It’s also a place for travel agents to actively communicate with customers, share information and lead discussions that result in informed travel decisions. Other websites are HotelRewards.com and ShowTicketRewards.com, booking sites for agents to book rooms for their customers. Travel Tribe recently launched AgentStudio, a turnkey content-rich website solution for travel agents. This subscription-based solution is a robust marketing tool for travel agents to display destination information, travel deals and offer hotel booking for their customers directly through their website. Focusing on management training such as team building, leadership and development, Team Builders Plus has increased its revenue by nearly $1 million in the last three years, hitting $2.35 million in 2011. Their company goals are simple: to get Merrick Rosenberg and Dan Silvert’s book, Taking Flight!, on the New York Times’ Best Sellers list; and in the long term, to be the nation’s go-to company for team building and DiSC training. Advanced Benefit Advisors has maintained steady yearly growth, going from $2.6 million in 2009 to $4 million last year. Offering mid-market and large group employee benefits and wellness consulting, ABA recently joined the Benefits Advisors Network, giving the company greater resources including a medical director, pharmacy director and legal compliance director on staff to assist in clients’ needs. EHS has increased the number of staff as well as its areas of technical expertise and scope of operations. The company, which conducted approximately $22 million of business last year, has more than 100 employees in five offices up and down the East Coast providing engineering, communications, environmental and information technology products and services to government and commercial customers. Growth of 27 percent is especially notable when revenue started at $168 million in 2009. Coming in at $214.6 million last year, Compas, Inc. is the largest corporate buyer of pharmaceutical- and health care-related media, whether it be digital, broadcast or print. Other services include targeted media buying with ByDoctor, professional journal media buying, media planning, supplier alliance management, business results management, customer insights and more. Grimley Financial, which recorded $2.47 million in revenue last year, is a full service, value-added, complete revenue cycle collection agency concentrating on health care, commercial, consumer and education collections. Specialty services are pre-collect, bad debt, bankruptcy preference and credit awareness. The company is currently reviewing the possibility of acquiring health care boutique agencies. According to Irvin Richter, satisfied clients beget new assignments and future growth. For that reason, this project management, construction management, program management, risk management, and construction claims and consulting company aims to continue its growth by minimizing risks for clients and building a solid reputation. With 110 offices worldwide, Hill International reached $501.5 million in 2011. Jack Zoblin left a comfortable position with Qwest, only to work for a company that folded within a couple of months. His reaction? Use his life savings to venture out on his own. The growth of his telecommunications and data consulting company has been steady, enough to buy their current office location two years ago. According to Zoblin, cloud computing has expedited the convergence of voice and data communications and created opportunities to offer additional IT and computer-related services to clients. Building the partnerships and acquiring the resources that meet those additional client needs ranks high on his company’s goals. After recording $1.5 million in revenue last year, Cory Communications hopes to, in the long term, expand across the country. Never underestimate the little guys. These small businesses in South Jersey, with revenues ranging from $50,000 to nearly $250,000, are making impressive strides in their yearly numbers. These singing telegrams, with characters ranging from bellhops to gorillas, are sure to make people chuckle. But what’s not something to laugh at is their increase from $11,359 in revenue in 2009 to $52,264 last year. Increasing from seven of their memorable and unique telegrams a month to now 40, the company is on target to reach $68,000 this year. The Center for emotional health prides itself on being a supportive, collaborative environment for adults, adolescents and children seeking psychological evaluation and treatment of a wide range of psychological disorders and other clinical problems. After increasing more than 300 percent since the year of its founding, Dr. Marla Deibler plans to expand forensic psychology services and service contracts to organizations and government agencies. Perlow Productions made a risky move in 2007, relocating 300 miles from Boston to Marlton. But it paid off. Providing services including HD videography, video editing and graphics creation services for corporate, non-profit and agency video productions, President Mike Perlow sees a strong future in which they’ll continue to expand upon their client base locally, nationally and internationally. Top Executive: Founder/Senior Search Engine Marketing Project Manager Len Ward Rank Me SEO provides white label/private label search engine marketing campaigns to advertising agencies, SEO agencies and other companies that sell search engine optimization, Google AdWords, pay per click and social media services. In just the first two full years of business, revenue rose almost 200 percent. Another 143 percent jump is expected in 2012, enough to double its workforce and open a larger office in 2013. After spending more than a decade working for some big name financial institutions, including GE Capital and Citibank, Mark Friedenthal decided to branch off and found his own portfolio management, 401(k) advisory and investment consulting firm in 2009. His goal, through client satisfaction and organic growth, is to rehabilitate the image of the financial services field. Already seeing significant growth, the company is on target for a 69 percent revenue increase in 2012. Published (and copyrighted) in South Jersey Biz, Volume 2, Issue 7 (July, 2012).